1) This paper has been prepared and presented as a keynote presentation at the FIG Workshop on e-Governance, Knowledge Management and e-Learning in Budapest, Hungary, 27-29 April 2006. This workshop was co-organised by FIG Commissions 2,3 and 7. The aim of my presentation is to review the principal definitions of policy and activities - within the limits set in the title - at national, regional and organizational level. The perspectives are global, national and local. My message is that all these levels, in decision making as well as actions, have to be made to work along coherent lines of working culture, with high profit expectations. In order for this presentation to be practical, and so that it could be utilized around the world, I will benchmark Finland with its latest global development, describing my own experiences and findings both in theoretical concepts and in practice. Increasing investments in research and development play a crucial role in governmental policy. Networking, orchestration and shared leadership form the basis for the ongoing paradigm shift. The basic values that support innovativeness in creating the desired knowledge society are the basic values linked to effective knowledge management: openness, trust, collaboration and knowledge sharing. Several actors, which operate with the same shared vision, affect the other actors in many ways. Shared leadership is based on the principles of partnerships and joint developer networks. The level of effectiveness and productivity needed in these organizations invariably requires new e-mechanisms and the capability of combining diverse competencies to increase the intellectual, structural and relations capital of all these organizations. In order to understand more about the importance and complexity and the deep core of knowledge processes in national policies the Finnish Association of Graduate Engineers TEK created a few years ago an instrument called the Technology Barometer (Naumanen, 2004). It can be described as a globally unique instrument that measures the state of technological and scientific expertise and development in a given country. The barometer is based on data and models describing the three different development phases of modern societies. In the barometer, the definition for information society is focused around investments in human and intellectual capital. That is, we measure the level of basic education and schooling and the skills and knowledge of the general public in the nation, and both public and private investments in research and development. The knowledge society produces commodities of high knowledge value. Knowledge and expertise constitute the crucial elements in production, with information and communication technologies comprehensively supporting interaction, dissemination and exploitation of knowledge, plus the provision and accessibility of services. In the Technology Barometer, the knowledge society measures assess the gearing of the human and intellectual capital investments towards science and technology, the use of information and communications technologies, and the outcomes of these investments. A knowledge-value society is an advanced form of the knowledge society. Innovation, technology development, economic regeneration, openness to ideas and their active exploitation are all inherent elements contributing to the basic values and culture in the society. In the Technology Barometer, the measures on knowledge-value society focus on entrepreneurship and venturing, innovation networking, and adaptations of innovative practices in a nation. The knowledge society produces commodities of high knowledge values. These values bear the properties of high technique, high art and high skill. These, operating together, increase the value of products and services many times over when compared with their production costs. Many customers are able to use them at the same time, in distant places, and they are not worn out. In the knowledge society there is no principle of par value exchange. The value of knowledge has no direct relation with the production cost. The prices of products are based on markets, tastes, or preference of customers. In the knowledge-value society, creative labour is a major factor. The economy includes, and is mainly based on intellectual enterprises and high-tech parks in which the entrepreneur has many roles, including the scientist. The society is characterized by a positively synergistic interaction of information, knowledge and affect. Leading companies develop holistic models of corporate cultures built upon shifting duties, team structures and high level of expedient personnel turnovers. Traditional efforts to manage workers shift to managing relationships with increasingly demanding customers and developer networks. The unit of analysis for innovation is not a product or a technology, but a business concept (Hamel, 2000). Networks are becoming increasingly common, and the role of innovations is growing. The key concepts include network form of organization and growth based on social innovations (Himanen, 2004). In the oral part of my keynote presentation, I will show some results of the Technology Barometer studies. However, I am using it more as a frame to describe the core contents of the ongoing change processes with respect to human, organizational and economy-wide dimensions affecting our societies. To make this analysis easier to follow, I will use the term knowledge society to describe both of these knowledge intensive phases of the societal development of the late 20th century and the early 21st century. From the leadership and management perspective, the major challenge of the knowledge society is that noteworthy innovations are based on complex systems of technological know-how. Another aspect of the same challenge is that the social processes of knowledge society are no longer created by the traditional industrial society logic. Instead, one must create and maintain innovative environments and the operating culture of value networks. Leadership that gets results has changed its traditional ways of operating both at national and regional levels as well as within communities. Leadership that aims for and is based on rigid planning no longer guarantees success. Instead, readiness to change, flexibility and delegating are the most important catalysts that generate a competitive edge. Orchestration and shared leadership form the basis for the ongoing paradigm shift. The basic values that support innovativeness in creating the desired knowledge society are openness, trust, collaboration and knowledge sharing. The core processes of innovative environments cannot be managed without active participation and the all-round delegation of responsibilities. This refers to a situation where several actors in concert focus on the development, and affect the other actors in many ways. Shared leadership invariably requires new e-mechanisms and the capability of combining diverse competences. In a dynamic operating environment, leadership requires the capability to lead beyond the borders of the organizations and communities from which the leader’s authority is derived. One has to be able, proactively and in a self-guided way, to create something new in the business environment, which is formed of complex and continuously changing networks. International competitiveness benchmarking shows that Finland is one of the leading knowledge-based economies. However, only three generations ago, Finland was a very poor country, with most of its population in agriculture, largely dependent on its forest resources, only loosely integrated into the main channels of capital, markets, and technology in the world, and with limited public coverage of people’s needs. The Finnish model is based on high-level basic education and strong commitment of all citizens to lifelong learning. The state has used incentives, strategic planning and participatory mechanisms. The combination of deregulation and effective providing and facilitating the public infrastructure has stimulated growth. The state has acted as a promoter of technological and social innovations, as public venture capitalist and producer of knowledge labour, thus creating the conditions under which Finnish business could restructure itself and compete globally. Every process has to be a capacity building process. From the perspective of individuals and organizations it is especially a competence development process with special emphasis on attitudes and values of society. Recent years have seen the introduction on an enormous scale of new methods and means of interactivity and networking. New social and cultural innovations are likewise being developed at a brisk pace. Thus it is very natural for us to be engaged, fresh-mindedly and through broad cooperation, in seeking new contents and ways of doing things also for democracy. The role of parliaments is becoming even more crucial than before in developing science, technology and innovation policy to increase the quality of life and human welfare. ”Decision making needs the support of knowledge, information and expertise. Enacting laws is a colourful and challenging job in that we must at the same time be able to foresee the effects they are likely to have and how well they will function in practice. It is of the utmost importance that the dialogue between researchers and practitioners of science, on the one hand, and decision makers, on the other, functions well and keeps to topical themes. Up-to-date research results facilitate argumentation and the presentation of reasons supporting decisions. “Today, Finland is a knowledge-based society, or at least fast progressing towards one. From the policy perspective, we see this largely as a consequence of a long-term commitment to a society that facilitates and promotes knowledge creation and diffusion - innovation, in other words - a society that provides safe, interesting and socially sustainable living conditions for the citizens. Our science, technology and innovation policy is characterised by a determined investment in knowledge and information. Instead of looking at education, science or technology separately, these have been treated as an operational whole - as a dynamic innovation system. In the light of international evaluations, this strategy has been proven to be successful. We may well assume that the success of a society will in the future largely depend on its capacity to adapt to a changing environment. Hence, emphasis should be given to the capacity to foresee different technological and societal development paths and to assess the effects of decisions relating to those. In the view of the Committee, globalization, internationalization are prerequisites for the success of the knowledge society. We must prepare for internationalization and make use of its benefits on every level of society. Companies, institutions of learning, political parties, civic organizations, labour-market organizations and other interest groups must all make their own contributions to developing their international aspects. In the view of the Committee, information and knowledge are fundamental factors in future success. Prerequisites for successful endeavours include mutual trust between skilled personnel and other actors in various sectors, cooperation and purposeful networking. By networking we can improve the new strengths developing in Finland and the clusters based on them. In the view of Committee, innovations in the services, industrial and administrative sectors are essential for the success of the individual and society. Culture as a source of creativity lays the groundwork for innovations. Innovative activity and networking are particularly important in education and work life. Innovation does not come from nowhere. The culture in which activities take place must support fresh-minded thinking and a search for new ways of doing things. In the view of the Committee, good governance of life and affairs plays the key role in present era of strong transformation. The changes that are taking place represent above all new challenges and opportunities for every individual, every company and every community as well as for the whole of society. They must be predicted and steered in the desired direction. To a greater degree than in the past, citizens’ own activity will determine the immaterial quality of their lives. Lifelong learning must be adopted as the strategic foundation for Finland’s national success. Modern ICTs have developed dramatically in recent years. The new applications that have occurred may have a significant impact on the innovation capability of companies. ICTs are multifunctional technologies as the figure 2 shows, and they can be used for different purposes. It is the specific use strategy that primarily influences the benefits that can be gained from the application of ICT. As ICTs made it technically possible and economically attractive to codify various kinds of knowledge, previously remained in tacit forms, they were traditionally used to automate operations as well as production and administration processes. Thus they replace human labour with a technology that enables the same processes to be performed with more preciseness and continuity. As a labour-saving device, ICTs do not differ in any way from traditional machines. However, different types of work and decision processes are more or less amenable to developing routines and automation. Since ICT has grown cheaper and more powerful, the number of work processes that can be automated has increased. But even if we take into account advances in artificial intelligence and the codification of tacit knowledge, the potential for ICT to substitute for human work is limited. Managerial work or professional work, which is more complex and cognitively demanding, has proved less amenable to computerisation. Similarly, tasks that require judgement, creativity, and frequent exceptions have also proved remarkably difficult to automate with modern computers. Innovation functions, we can conclude, are less amenable to automation; as they depend to a great extent on human capital and tacit knowledge. This development can be characterized to be one of the major megatrends influencing the global labour markets. 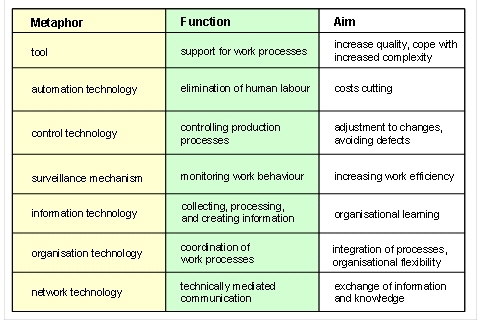 The key action areas for all western societies are especially the following ones: 1) increasing competence and innovation in working life, 2) transforming competence and innovation into job-generating growth, 3) managing change in the work place and 4) managing change on the level of the labour market (Information Society Council, 2005). Highlighting the endorsement of competence and innovation as the guiding principle the Council emphasized the imperative that the education of adults already in the workforce is rendered a target of systematic measures. The operating culture must focus on innovation and systematically enforce positive synergies between development in technology and ways of functioning in the different fields of society. The focus must spread from individual professionals to the management and manifestations of competence in organizations and national innovative environments. The most essential question is how to transform competence and innovation into employment-intensive growth. This requires an increase in entrepreneurship, increasingly efficient interaction between the interfaces of success clusters, more efficient conversation of innovations into products and services, and the capacity to act efficiently in the global market, enforcing the innovative capacity of employees and finding new solutions to improve the opportunities for participation among groups at risk of social exclusion. The Council therefore suggests that the cultural development of work communities and the methods of this development are selected as the most central target of actions. The most pivotal targets are: 1) the culture of working together, 2) the efficient exploitation of new information and communication technologies, 3) work processes and process methods and 4) innovation, anticipation and the management of innovations. The Parliament of Finland has approved the national strategic goal of being the forerunner nation in innovativeness and education. The Parliament has also determined that the objective of innovation is to create Finland the world’s best innovative environment. These goals generate significant challenges, especially for the development of regional and local innovative environments, and for the development of those services and operating cultures that foster networking (Parliament of Finland, 2005). The fundamental preconditions for responding to these challenges can only be created when innovations’ significant effect on productivity can be proved, and when enterprises, other communities and citizens actually experience the results of innovation and are ready to change their own operating cultures. This all requires deeper understanding of innovativeness and characteristics of innovation processes. Since the year 2000, the Parliament and the Committee for the Future have implemented several technology assessment projects in which a stand has been taken on the creation of good innovative environments. The first of these assessments handled the topic: “The impacts of knowledge management on work and work culture”. It simultaneously created the base developed to facilitate both the methods and the parliamentarians’ active participation in the Committee’s creative assessment. The report was published in 2001. A description of the results and the processes used, as well as their implications in Parliamentary processes, was published in the spring of 2002 in English under the title: “Developing and Implementing Knowledge Management in the Parliament of Finland”. Responding to the aforementioned demanding challenges requires in particular a deep understanding of regional and local innovation processes as well as of mechanisms for creating something new. Research on innovation has markedly increased in the last few years but too little attention has been paid to the innovation processes of regional and local economies. The Committee for the Future has chosen the creation of innovative environments and innovation leadership in regional and local economies as the study topic and the focus of assessment. In this way, the Parliament wants to cast special attention on this vital area of policy for the future. Innovativeness has become one of the most important success factors in the modern economy. The internal human capital of the community, consisting of traditional factors such as individual skills and of societal processes and know-how in utilising them, has become an increasingly decisive success factor within the resource structures of businesses and communities. 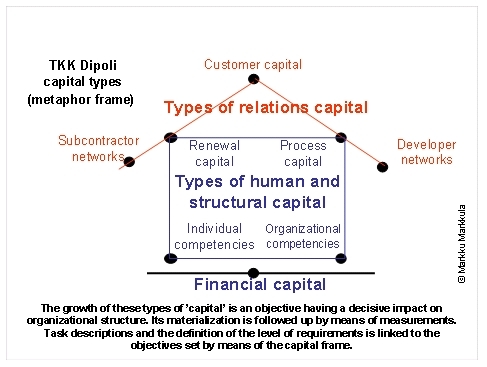 In addition to the internal factors, the capital of the community is made up of the methods and the operating culture with which it manages its external structures and relational capital, as well as with which it is able to operate in various value chains and in the networks comprised by them. The development of the knowledge society has brought systems intelligence to the core of the success factors, i.e. the management of various logic chains and networks. For a community to succeed it must - consciously or subconsciously - control the value chains and value networks in its own field and in its operating environment as well as the networks of persons and communities that operate in them. The term value network refers to the functional entity formed by actors of different backgrounds, competences and roles. Networking is based on partnerships where goals, processes and earning logic are synchronised. As regards value networks, all actions demand networking in a new way. Value networks are in a constant state of flux. With the help of value networks, it is possible to understand the interdependence and the multitude of inputs, results and gains, at least to a reasonable extent. Now when the operating environment is changing more and more rapidly, traditional management with the aim of tight planning no longer guarantees success. Instead, the ability to prefigure the future, and to shape it, has become crucial. These, combined with effective knowledge management and learning, enable the community to make wise choices and to ride on the crest of change as a strong actor. It behoves every community, small and large alike, to network and develop value concepts for itself that reflect its operating environment and operating processes. The success of private and public sector organizations is largely based on their intellectual capital and their ability to utilize it. By intellectual capital we mean the non-physical value sources of an organization – resources that produce value in the future. Especially in knowledge intensive organizations such as, for example, many public sector organizations, the intellectual capital forms most of the resource base of the organization. Therefore, it is important that production strategies support the development of products based on the quality of their contents. The expression organizational competence refers to an organization’s internal attributes that enable it to reach its targets. The number of attributes of organizational competence is large – theoretically the number is unlimited. All of the attributes of total organizational competence can be classified under three separate super-attributes: assets, competence of the individuals and structural competence. An organization’s environment is not an attribute of organizational competence, but it has a constant effect on the competence attributes and the competence requirements. Different stakeholders have different goals for the organizations, and thus organizational competence is observer-specific. The use of the concept of organizational competence is context specific; thus the required set of competences depends dynamically on the situation. These key findings result into a general definition of the concept: when we speak about organizational competence, we speak about an organization’s internal capability to reach stakeholder-specific situation-dependent goals, where the capability consists of the situation-specific combination of all the possible individual-based, structure-based and asset -based attributes directly manageable by an organization and available to the organization in the situation. At the end of 1990’s Finland had, by making some heavy structural and mental changes, recovered from a deep recession and high unemployment, which hit our economy in 1991-93. As a starting point for the National Information Society Programme the following statement was formulated: ”Finland needs a vision and strategy in order to be able to make full use of the opportunities inherent in the Finnish information society and to ward off the threats involved. Owing to rapid pace of development, the strategy has to be constantly revised.” As its basis the programme emphasised high quality and decentralised activities in order to get the different stakeholders actively involved using common guidelines. The stress was on commitment but crucial, in terms of the mental shift, was the fact that the most important ideas and proposals had been made and the foundations for societal and cultural change had already been laid years, maybe decades earlier. The changes, therefore, had active and knowledgeable supporters and implementers. support the objectives of sustainable development. At that time, in terms of international comparison, Finland was in the absolute forefront of information society development. Finland has made a substantial investment in education, training, research and development. Information and communications technology (ICT) products have significantly contributed to the growth of Finnish exports. The action plan (figure 4) to implement the IS programme played a crucial role in answering the challenges: the ageing of the population, high unemployment rates and the hectic pace of working life, together with shortages of competent workers in some fields. It was emphasised that the provision of electronic services and contents should respond to people's needs in different life situations and be accessible to all on different terminals. One central need is to increase interaction between people, and to promote interaction as an attribute of service. The content and service processes should be renewed from the viewpoint of electronic markets in local, national and international collaboration. The statutes governing electronic services should promote data security and the consumer's position. Open service interfaces promote competition. In the mid 1990’s there were a large number of ongoing joint projects geared to developing the information society. Synergy between these projects, eliminate overlapping and doubling, and thus reduce costs was seen as essential. Development networks were created between existing and starting projects in order to enhance knowledge and information transfer, and the compatibility of the services being developed. The spearhead projects listed below, and the development networks relating to them, were a concrete way of promoting the stated objectives and principles of development. 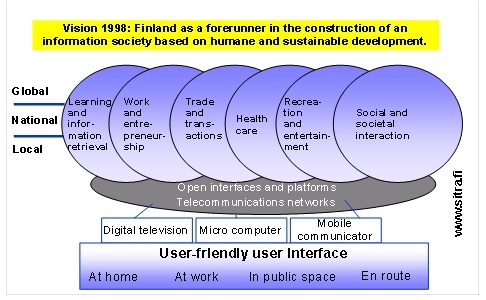 Some of the most important factors influencing the positive development in Finland are closely related to eGovernance. An effective and transparent public administration is a competitiveness factor and in the IMD International Institute for Management Development and WEF World Economic Forum competitiveness rankings during the last ten years government efficiency has been one of the keys for Finland’s success. Simplifying the regulations brings the biggest gains, and the timing and effectiveness of changing the laws has been successful. The use of ICT is important and it is increasingly supported by a customer-centric view instead of administration-centric. Rules of the administration procedure are more transparent than in most other countries. There are a lot of signs that the public sector working culture is changing its operational structures by applying the best principles and methodologies of engineering and business management. The meaning of technology increases all the time - even so that it will pass through everything and the effects are such that they often go unnoticed by the citizens. The role of “e” (information and communication technologies) can be simplified with the figure 5. Innovative learning and working environments. Both the political commitment to the necessity of change, and a strong financial support are crucial since the eGovernance is the matter of executive managers, not just IT-managers. The eGovernance activities and public management reforms need to be integrated, and there is a need for a change oriented eGovernance strategy that is integrated to the overall strategy within each agency. The processes need also to be revised or reformed. It is clear that the public sector can with a committed partnership policy be a ”primus motor” to introduce the policy of social innovations which are based on the applications of the latest technological developments. The key to success in the future will continue to lie in new knowledge-based products and services. Information technology and knowledge must be used to modernize traditional material production, as well as the service sector. Success in the future presupposes an abundance of innovations. These will emerge from basic and applied research, the results of which are put to use in product development. In Finland, the state and companies have, since the mid-1980s, been constantly increasing their spending on research and product development, reaching the level of 3,4 % of GDP already in the year 2000. Thanks to this, advanced technology’s share of exports grew from 6% to 20% in the 1990s, a decade that saw a doubling of exports overall. This development is an example for the rest of Europe, especially when taking into account the difficulties in implementing the Lisbon strategy. One of the key success factors being approved by the European Council is to raise the R&D expenditures to 3% of GDP by the year 2010 – this seen as a key for economic growth. In the new kind of knowledge economy, the attitude to knowledge is different from what it was earlier. Knowledge is capital, which need not and must not be saved. Knowledge is like joy: it increases when it is shared and is replenished only when squandered. In the past, knowledge was power, which could be "kept under the mattress" or used only to achieve one's own purposes and dominate others. Power belonged to the few and the smaller that oligarchy was the more of it they had. Advocates of the ideology of knowledge management argue that thinking in relation to knowledge must be altered in such a way that people understand that the distribution of knowledge is power, power that belongs to us all. Corporate executives and consultants emphasise that active networking is a precondition for international success. One of the important aims in knowledge work is to create new knowledge rather than merely to distribute or store what already exist. People's subjective interpretations are more and more important in knowledge work. Something that must be taken seriously, as a subject of research, is the way in which the human mind works. This all means the need for structural changes in education through effective visioning. Combining systematic exploitation of information and communication technologies (ICT) in teaching will improve learning results, when compared to conventional teaching. This will also bring new dimensions to teaching situations and the entire learning environment. Learning will be based on learning by doing and discovery learning and supported by making the learning environments and learning situations increasingly interesting. Commitment will be emphasised. Theory will be converted into action compelling people to create a shared space. This “Ba space” will shift the focus of action onto intellectual and virtual collaboration and a variety of collaboration networks. Action and results will be emphasised. As part of lifelong learning support, learners and teachers will create their own personal knowledge management “tool boxes”, emphasising systematic development and the results of action. Predicting the future will be emphasised. In lifelong learning, learners and teachers will emphasise the regeneration of knowledge. Consequently, the capacity and skills for critical knowledge processing will be understood to be the most crucial factors in learning. Rising to the challenges of information and knowledge will be emphasised. Learners and teachers will be able to use new learning and work methods to manage increasingly larger information and knowledge entities, and related sustaining networks. The basic knowledge management values – openness and trust – will be emphasised. It is only in an open atmosphere of trust that people can genuinely work and develop things together. Information society development will provide people with new, realistic opportunities to learn and develop their competencies on a comprehensive basis, regardless of their place of residence. Various ICT solutions and applications will generate new opportunities for the practical implementation of regional equality, based on the provision of high-quality learning resources throughout the country. Innovative, practice-oriented local and regional projects will help consolidate the efforts in the users’ best interest. At its best, learning is a communal process that involves, in a school environment, for example, the learners, teachers, parents, and their immediate vicinity. New methods and possibilities for learning are increasingly emphasising the communal character of learning and learning by doing, with the ICT development contributing by creating new learning tools and associated technological solutions and applications. Over the past few years, the development of ICT tools has focused on the interaction and communication aspects. In terms of the learning process, it is not necessary that one’s fellow learners and the required learning resources are all present within a single physical environment. Currently, Finnish eLearning competence is of a good international standard, and can be promoted onto the highest global level through determined development efforts. In a number of restricted sectors, we have already reached the world’s highest level. Our objective is to make Finland into a pioneer country in eLearning methodology and content production in the global market, and a globally successful developer and producer of method and content products, systems, and services. Different Cluster concepts of eLearning operations have already provided deep-going experiences and proved to be effective, especially on a regional level. The aim is to expand the network into a regional one integrating its activities with regional development. The Cluster forms a context for assembling regional networks for developers with operators from other regional networks and participating programmes. The Cluster’s multidisciplinary applied research seeks solutions to the challenges of regenerating learning and teaching, such as those imposed by breaking limits between educational institutions, internationalization, and lifelong learning. The aim of the Cluster is to quickly make the latest research results available for the development of teaching and training projects, and, in return, to receive feedback from the field to initiate new research (figure 6). At the same time, co-operation is promoted between the various levels and fields of education and training. In the Finnish experience the Cluster’s multidisciplinary research activities support the development of the Finnish Virtual University, Virtual Polytechnic, and Virtual School. Virtual teaching projects provide an excellent environment for experimentation and research, with the possibility arising to apply research results to network-based teaching without delay. This means that research and practice continually interact. The best known of the Finnish experiences is the Tampere eLearning Cluster. A great deal of positive experience has been gained from using the Cluster’s collaboration model. The Cluster can be viewed as an improved model of a network-based organization. Its birth was based on a “grassroots” initiative from a number of institutions, with educational institutions, university departments and other units joining in due course. Each of the new participants had various reasons and interests for joining, such as research collaboration, further training and post-graduate studies, international development projects, or a general need for knowledge acquisition and keeping up-to-date with developments. The best way to organize the Cluster’s operations is to have a lean and flexible structure. This enables fast reaction to changes in the eLearning field. One of the Cluster’s operational preconditions is that the organizations and participating individuals commit themselves to the activities pursued, and this has been achieved quite successfully. Joint activities are not planned and implemented by the steering group alone. Instead, the organizations have used active contact persons and successfully promoted networking and participation in the Cluster’s activities. The Cluster’s premise is to invariably connect collaboration with the unit’s or individual’s own activities. This means that collaboration is not an extra task but a real benefit to the participants. The Cluster has both internal and external assignments. Cluster members mutually learn and develop collaboration and their division of work, for example, in project preparation and teacher training. The Cluster serves its members and other operators by providing information on eLearning events, and organizing seminars, for example. The Cluster is also a negotiating and collaborating partner. It represents its members and markets eLearning expertise and competence in the field. In large-scale internal undertakings, for example, a major consortium creates an atmosphere of trust. Individuals also benefit from being members of a larger entity when embarking upon a project. The Tampere eLearning Cluster operated in close cooperation with an extensive eTampere initiative. They were both organized as projects and are now already closed after operating for several years. Their strengths were found in their multidisciplinary activities, interaction between theory and practice, and collaboration between various operators. The Cluster’s aim was to be a pioneer in developing new innovative eLearning technologies and applications, especially from a user-friendly perspective. Increasingly opportunities are emerging through the development of information networks and software packages for systematic knowledge management development. The global sources of knowledge are available at work places and educational establishments – any place where there is a computer with an Internet connection. The deployment of web-based work methods along with the development of group-specific methods will increase the teams’ and communities’ results, especially in cases where the people are mobile and when working permanently in a joint physical space is not possible or expedient. Working together is also learning together. The use of virtual networks and new user-friendly software packages will profoundly change people’s work and study habits, within the foreseeable future. Building a learning organization involves managing change where the leaders must pave the way and show an example. The management will have a decisive role to play in generating and maintaining the required positive spirit. Sharing the knowledge capital presupposes an open attitude of trust. Even here, the management will be in a key position. The management must also have the courage to move from interaction towards learning together so as to be able to act as a real model. Success and innovation thrive in a learning organization atmosphere, since it is here that knowledge surpasses the division of labour, job descriptions and hierarchical boundaries, and finds its way to providing the subject matter for new insights. When looking for innovation, we must have the courage to break boundaries: it takes courage to combine totally different themes from various fields and cultural backgrounds. In addition, combining the various elements requires a considerable amount of time. When setting the targets, we must remember to leave ample time for change. A frequent mistake is to reach for too much too quickly. And if the results do not meet the expectations, people quit the job in hand, even though the process is only beginning. Developing the methods of individual and communal knowledge management – the creation and use of a toolbox culture – is the basis for learning organizations. The Knowledge Management Dynamo (KM Dynamo, figure 7) is a knowledge management concept that has been described, for example, in the report: “Developing and Implementing Knowledge Management in the Parliament of Finland” (Suurla, Markkula and Mustajärvi, 2002). The concept is intended to help individuals and communities in their determined effort to improve their work cultures. The dynamo is based on values, their significance for both individuals and communities, and the necessity of goal-directed action. - In the first phase, theory and practical exercises are used to realise the importance of basic knowledge management values (openness and trust). People learn how to consciously develop and change themselves. Similarly, people become aware of their work method values (collaboration and sharing of knowledge) that are resolutely applied and developed on a continual basis, to achieve spiritual and operational strength for the community in question. In the second phase, people learn to work together in order to internalise their values. In this phase, the driving force will emerge from realising the change in progress and from people’s will to develop themselves and their attitudes. This phase is used to describe the fostering of values as the capacity and ability of an individual, with a passion for learning, to surpass his or her personal limits and learn to work with other people. The third phase describes the methodological basis of conscious change. Achieving the described ideal state (surpassing one’s limits with others) requires new work methods and by using them the prevailing work culture can be changed and developed in practice. The fourth phase describes what is required to launch a continuous regeneration process. Learning competencies, creation processes, a dynamic Ba-space, and virtual networks are all dynamic processes that communities must use and develop on a continual basis. The described systematic development and regeneration will ensure that the issues in hand will not become blocked, and that learning and values will function in the community’s daily activities. Ba (space) is a multidimensional concept, the creation of which, especially, has been studied by Ikujiro Nonaka, a professor from Japan. Here, space is used to refer to a point in time, a location and culture between people, which promotes working and learning together. It has been observed that, from the point of view of knowledge dissemination and the diffusion of new ideas, open work spaces are more favourable than closed, isolated office rooms. However, even a good physical space is not sufficient as such, due to the fact that people’s spiritual culture is decisive. Ba thinking will enhance networking and the exchange of ideas between people. Improving the functionality of Ba-spaces is a common cause for all parties. Developing the methods used in joint activities and systematizing the meetings of experts from various fields will increase the possibilities of benefiting directly from Ba-type activities. Ba is a multidimensional forum of activities and an environment with constantly changing boundaries where people share, create and exploit knowledge together. This takes place both in the people’s thinking (sharing ideas) and in their actions (working together). The creation of knowledge calls for an encouraging environment and frame of reference due to the fact that the context provides the knowledge with meaning. To be able to interpret knowledge and create meaning, man needs a social, cultural and historical reference frame. To be an efficient, innovative and responsible knowledge worker, a person must be capable of exploiting the knowledge and expertise produced by other people, be able to develop his or her core competence on a continual basis, know how to operate in networks, master ICT, and be able to build such a space where he or she can co-operate with others. On this level, the challenge is encountered in changing the work methods towards systems thinking, in the deliberate combining of various technological tools and methods, and in continuous development of one’s own work methods, and in developing new ones. The central issue in working and learning together in knowledge management is the will to use and develop documented, visual work methods for the purpose of promoting the generation of a communal work culture. Bringing about the desired work culture requires sustained long-term effort to improve one’s own work and the entire community’s activities. At the same time, a systematic approach will be developed to enhance joint activities. eLearning can provide significant opportunities for this. Castells Manuel and Himanen Pekka (2002). The Information Society and the Welfare State: The Finnish Model. Oxford University Press, Oxford. Finnish National Fund for Research and Development SITRA (1998). Quality of Life, Knowledge and Competitiveness. Sitra 211, Helsinki. Hamel Gary (2000). Leading the Revolution. Harvard Business School Press, Boston, MA. Himanen Pekka (2004). Challenges of the Global Information Society. Committee for the Future, Parliament of Finland. Helsinki. The Information Society Council (2005). Towards a Networked Finland. The Information Society Council’s report to the Finnish Government. Helsinki. Lipponen Paavo Prime Minister of Finland. Keynote address at the Unesco Round Table Meeting, Helsinki, January 13, 2003 (Unpublished). Markkula Markku (2003). eLearning in Finland. Encancing Knowledge-based Society Development. Gummerus. Jyväskylä. Naumanen Mika (2004). Technology Barometer. The Finnish Association of Graduate Engineers TEK, Helsinki. Parliament of Finland, Committee for the Future (1997). Report of the Special Parliamentary Committee for the Future. Part 1 “Finland and the Future of Europe”. Helsinki. Parliament of Finland, Committee for the Future (2005). Regional Innovative Environments. Technology Assessment 23, Helsinki. Schienstock Gerd and Hämäläinen Timo (2001). Transformation of the Finnish innovation system: A network approach. Sitra Report series 7. Helsinki. Suurla Riitta, Markkula Markku and Mustajärvi Olli (2002). Developing and Implementing Knowledge Management in the Parliament of Finland. Committee for the Future, Parliament of Finland. Helsinki. Uosukainen Riitta Speaker of the Parliament of Finland. Opening speech at the Unesco Round Table Meeting, Helsinki, January 13, 2003 (Unpublished). Taatila Vesa (2004). The Concept of Organizational Competence – A Foundational Analysis. Jyväskylä Studies in Computing 36. University of Jyväskylä. Jyväskylä. Mr. Markku Markkula is the Director of the Lifelong Learning Institute Dipoli of Helsinki University of Technology TKK. TKK Dipoli is one of the largest continuing education providers among universities in its field in Europe. The Institute, whose annual turnover totals to 12 million euros, employs about 110 staff members and engages about 1,500 visiting lecturers per year. Mr. Markkula’s special competence areas are: professional development, knowledge management, learning organization, lifelong learning, e-learning, regional policy, national innovation systems. He has published several books and given hundreds of conference presentations, as well as written numerous articles on these issues. Mr. Markkula was Member of the Finnish Parliament 1995 - 2003. As MP he was a member in two permanent Committees: the Committee for Science, Education and Culture, and the Committee for the Future. He served as the President of EPTA Council, European Parliamentary Technology Assessment Network in 2001. He contributed as a member to the EU High Level Expert group on Technology Foresight in 2001-2002. Between 1989 and 2001 Mr. Markkula worked as a part-time Secretary General of IACEE, the International Association for Continuing Engineering Education in 1989-2001. Mr. Markkula is the Chairman of the Board of Directors of EuroPACE – European Professional Association for Collaboration in eLearning. During the years 1992-2005 he served as the Chairman of the Board of the Finnish Association of Graduate Engineers TEK (60,000 members). He is the Chairman of the Board of the Finnish Information Society Development Centre TIEKE. He is the Chairman of the University Continuing Education Network in Finland. In 1996 Mr. Markkula took up chairmanship of the national campaign committee for the European Year of Lifelong Learning. In addition, he represented Finland in the EU Lifelong Learning ad.hoc. committee. He has been chairing the Continuing Education Working Group of the European Society for Engineering Education SEFI 1987-1992, as well as from 2004. In 2002 he was appointed by the Finnish Ministry of Education to operate as a One-Man-Committee to make recommendations for the Finnish eLearning policy. This work was completed in 2003 and the report published in 2004.